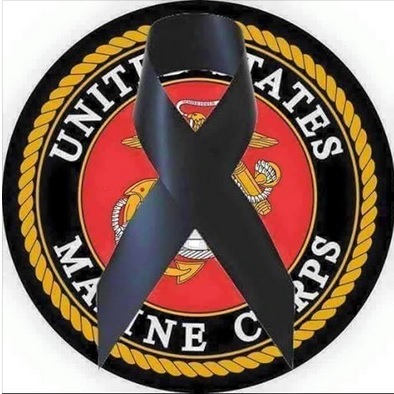 Thank you for serving our great Nation. 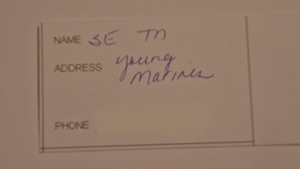 Happy 238th Birthday, USMC! 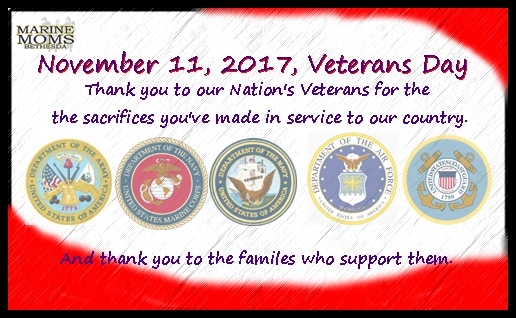 Thank You, Veterans! A beautiful fall day for the 238th Birthday of the United States Marine Corps! It just so happened our November luncheon date landed on November 10th, the birthday of the greatest fighting force in the world! It was also the day before Veterans Day. Such an honor to serve the Marines, Soldiers, Sailors and their families a special luncheon on the combat ward at Walter Reed. Katie, Julie, Dina, Deb and I planned to arrive a little before 10 AM. 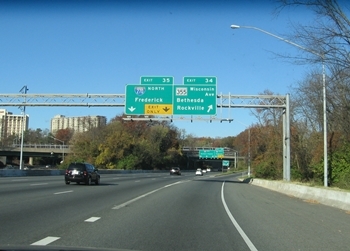 Deb drove, traffic was easy and she and I got there a little early. As we rounded the corner after going though the gate we had to stop for the wildlife. 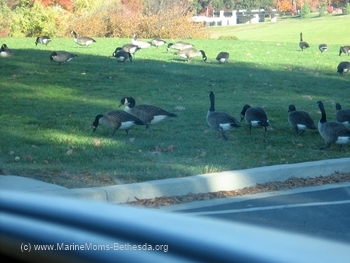 No, Moms, not bored Marines… 😉 There were geese taking their good ol’ sweet time waddling across the road. We unloaded and took everything upstairs with the help of the Gunnery Sergeant. It was nice meeting him and putting a face to the emails. Deb went to park the truck while I began setting up the room. Katie, Julie and Dina weren’t far behind us. All set up and waiting for our guests! 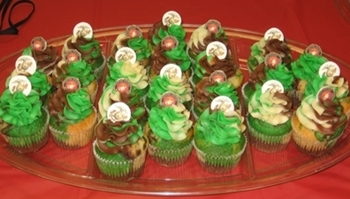 They came from Cupcake Blvd. in Gambrills, MD. And they were gooood! A very full “niftie-gifties” table! 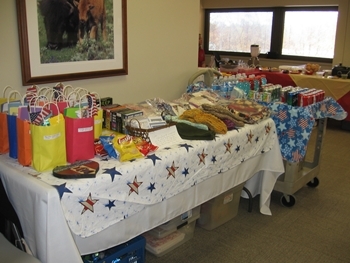 The nifty-gifties table was set up with pantry bags and other things. Julie does the shopping and packing for the bags, which have snacks and a few other things in them, just something to have in the hospital room so they don’t have to walk down the hall to the vending machine for a day or two… or three. Also on the table were books on CDs, great for vision-impaired patients, from Bob and Linda, Carole and the Castaways’ hand-knitted slippers and beanies, quilts from both the Bayside Quilters and Olde Kent Quilt Guilds, and composition books from Katie. 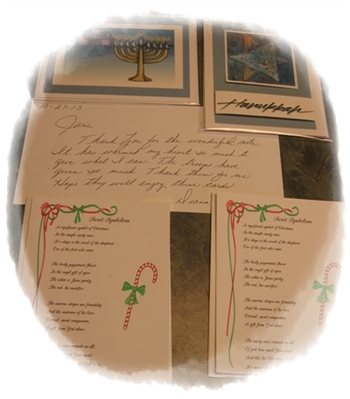 Diana in Florida sent blank handmade Hanukkah and Christmas cards for the patients and families to have if they wanted them. They were beautiful, as were the “all occasion” ones she sent earlier this year. 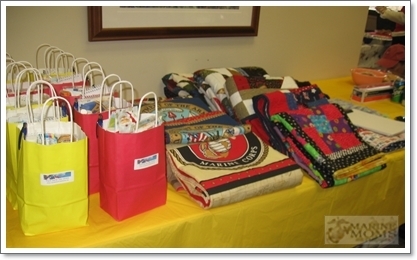 To everyone who help make the luncheons possible, your “Gifts From the Heart” mean so much to those we serve. Thank You! The time came that makes all of the planning, shopping, and preparation worth it. One of the patients “signed” to us – he couldn’t speak because of his recent surgery so he spelled the words out with his hand, and his wife translated “Thank You!” for us. 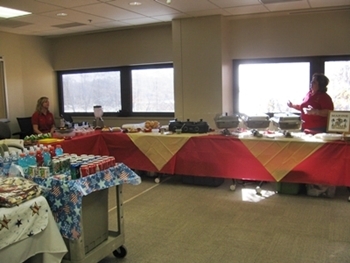 Some of the people we served had been to past luncheons. More than once or twice… or thrice… and may still be there when we go back toward the end of January. One will be moving on to a Polytrauma Unit at a VA Medical Center so he can be closer to home, and others will be back and forth between the surgical ward here at Walter Reed and Bldg. 62, the out-patient apartments, for many more months. One Solider, very well-liked by the other patients, had started out at the old Walter Reed – three years ago… A few more surgeries and this part of his recovery will be completed, then the next steps of his rehab begins… with his Mom by his side ‘walking the walk” with him. 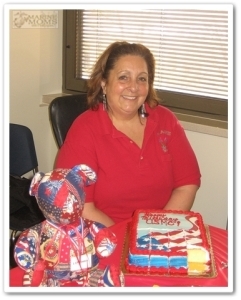 In spite of the life-altering injuries our troops and their families are living with in their “new normal”, their UPBEAT SPIRITS and “CAN DO” attitude are MORE than inspiring…They take their “Warrior Ethos” and they apply it to their new mission – Recovery. Do not tell them “can not”. They will prove you wrong. Lessons many of us would do well to pay attention to when we’re having a bad day. And to our Veterans, Thank You for serving our country!